Talking about hibernating, my usual long and boring posts dedicated to my rants, rambles and memoirs certainly seems to go on a long hibernation! I raked my brains and I just couldn’t find the words spilling on this space as they normally do! It could be because hubby is away from the last 2 days attending conference and black tie gala dinners, leaving me in charge of one hyper active pre-schooler and home. And also the fact that our impending trip to India in few weeks’ time is making me all bubbly and excited! 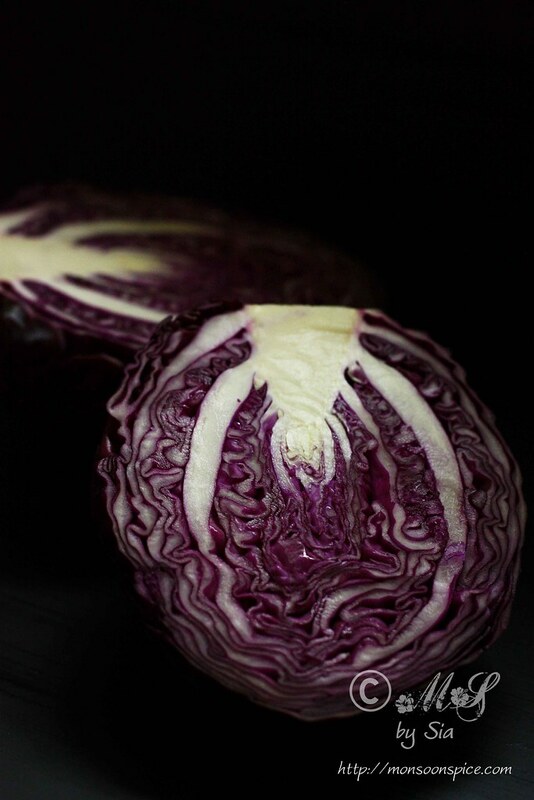 Red Cabbage ~ Purple beauty! With so many things happening and keeping me on tip of my toes, this post and the posts coming up next few weeks are going to be short ones with just recipes. 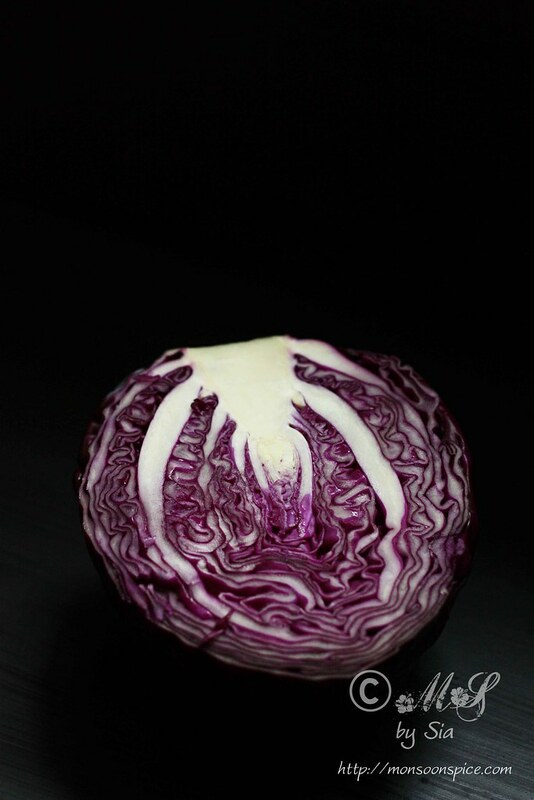 Today’s recipe is Spicy Red Cabbage Slaw or Salad that I have been hooked for some time now. 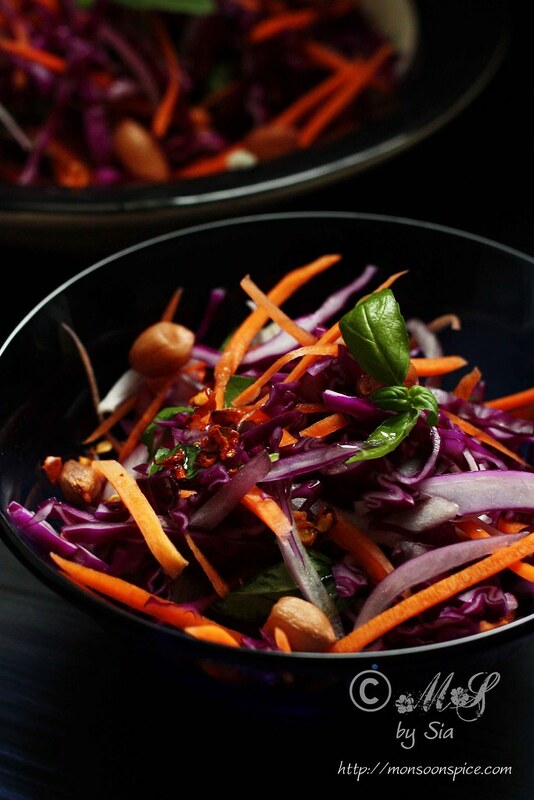 Spicy Red Cabbage Slaw or Salad ~ Seriously tasty! I was not much of a salad person as far as I can remember, but since the last couple of months I have been enjoying different kinds of salads like never before. 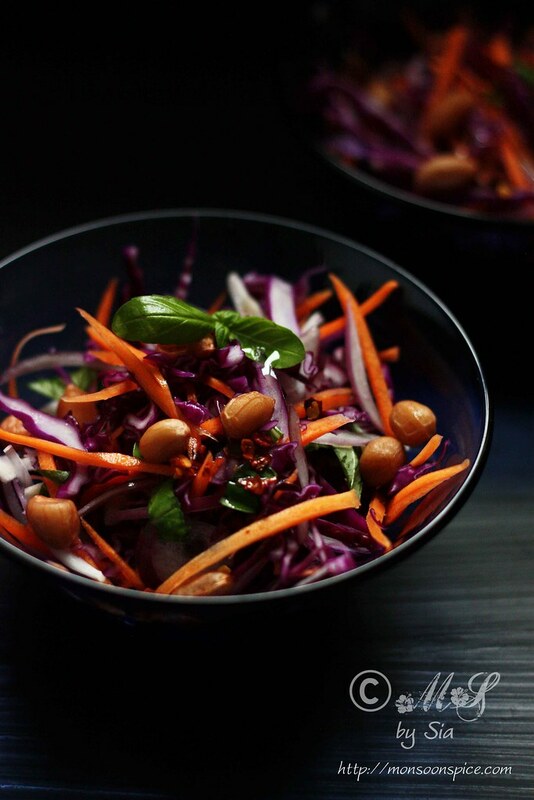 This Spicy Red Cabbage Slaw or Salad currently tops my list of most favourite salads. 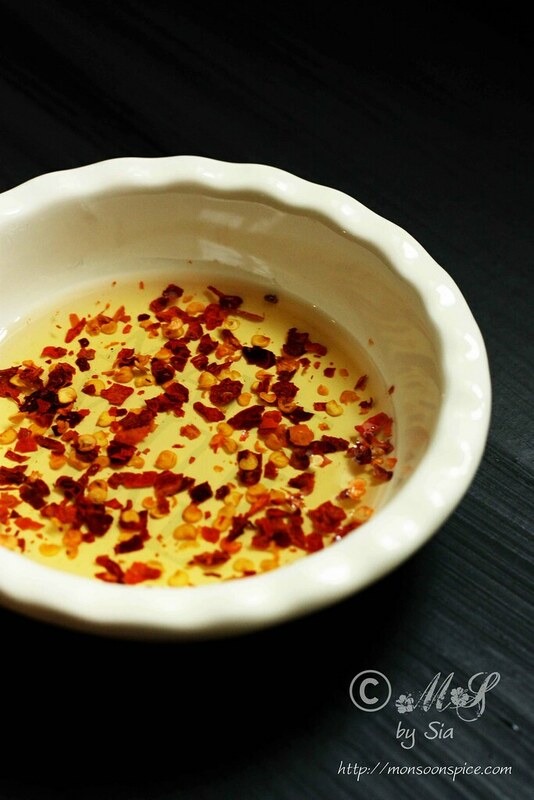 Mix the red chilli flakes and lime juice with olive oil and beat it for a minute with a help of a fork. Set it aside until needed. Take peanuts in a microwave safe bowl and add about ¼ tsp of salt. Pour enough water to just cover the peanuts and microwave the peanuts on high for 3 minutes. Drain all the water from boiled peanuts and set aside until needed. 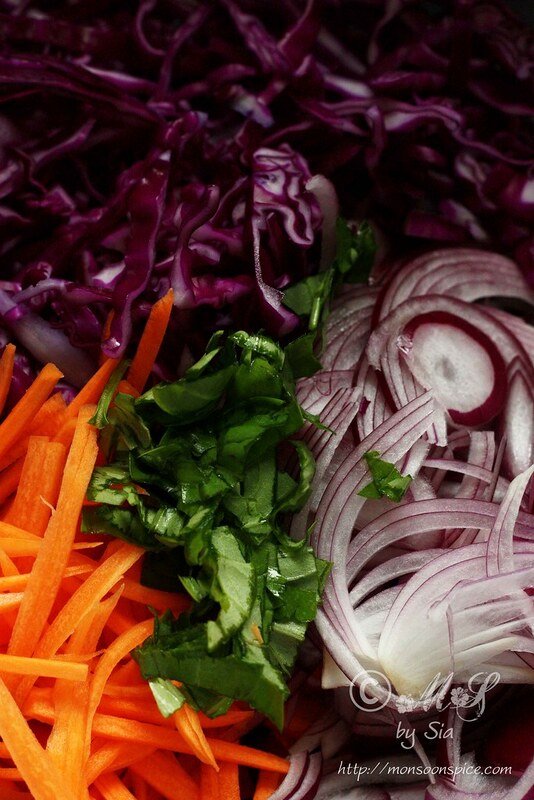 Take thinly sliced red cabbage, onion and julienned carrots in a large mixing bowl. To this add boiled peanuts, roughly chopped coriander or basil leaves and salt to taste. 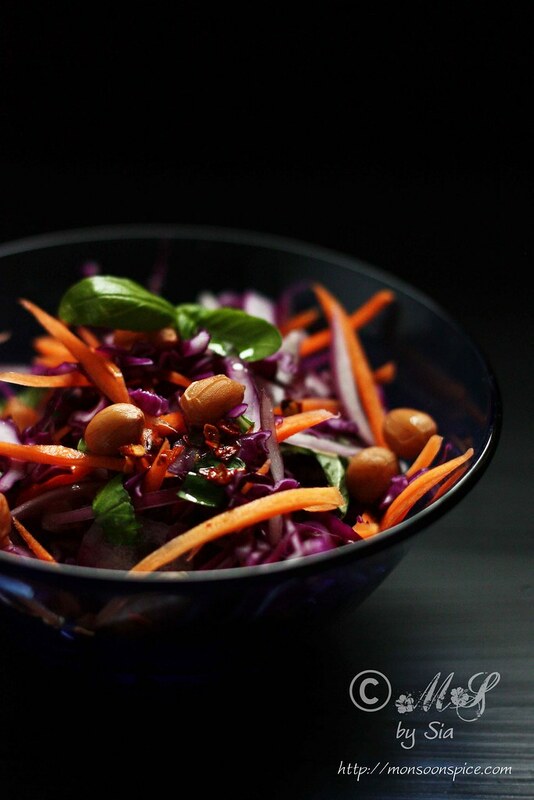 To this add spicy chilli-lime olive oil dressing and mix them all well together. 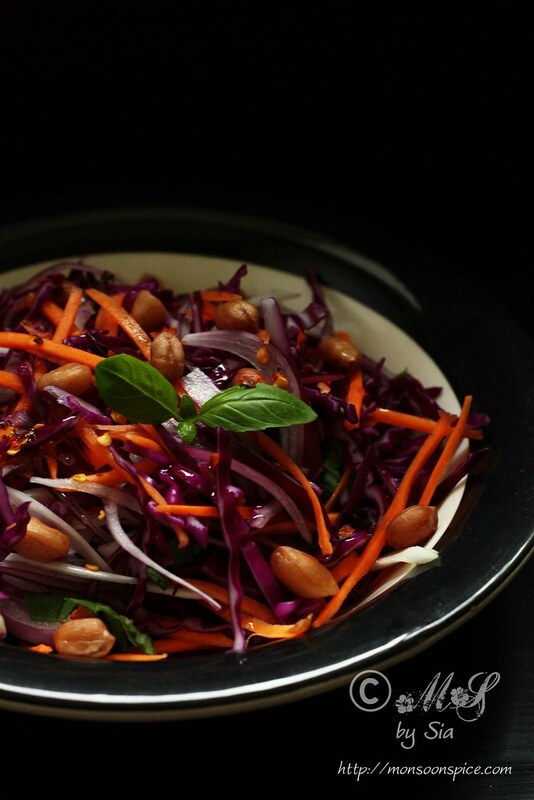 Serve this delicious and crunchy Spicy Red Cabbage Slaw/Salad as a side or in wraps and enjoy! You can use red chilli powder or paprika in place of chilli flakes. Adjust the amount of chilli flakes, salt and lime juice as per your taste. You can serve it on its own as a light meal or use them as a stuffing for wraps or pitta bread with a spread or sauce of your choice to make a complete meal. A marvelous combination! Colorful and scrumptious. Beautiful salad! Thanks for sharing. Looks so good. Fresh healthy and delicious! 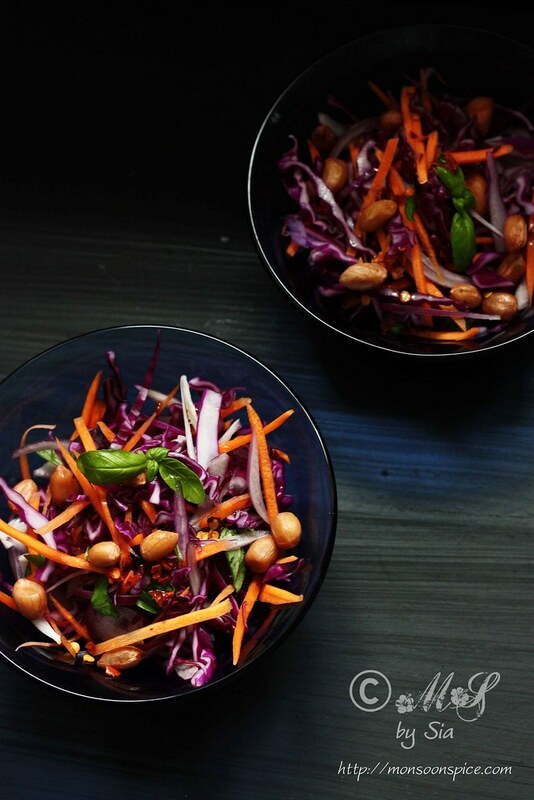 That's a colorful salad..Looks yummy too.. Gotta try this !! Beautiful pictures. 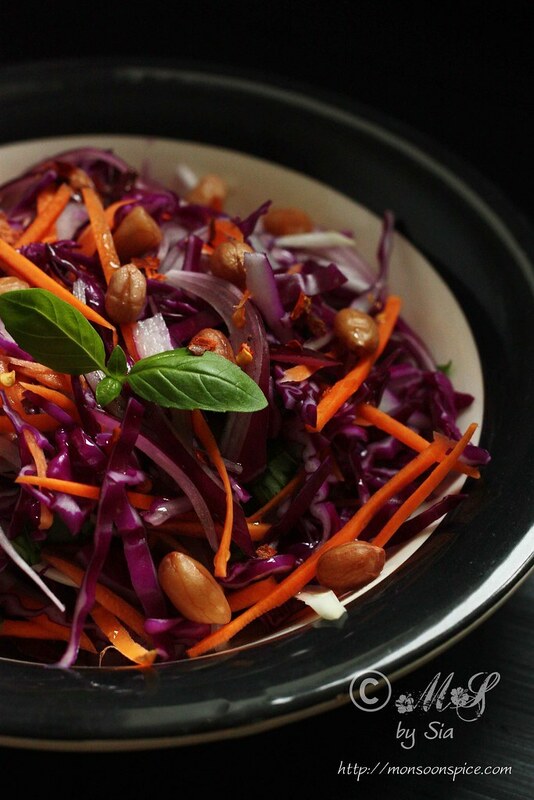 The slaw is simply amazing and the peanuts in em', oh yum. You know what I love about this post and many of your posts, it's all about the food. You make food look really appetizing. 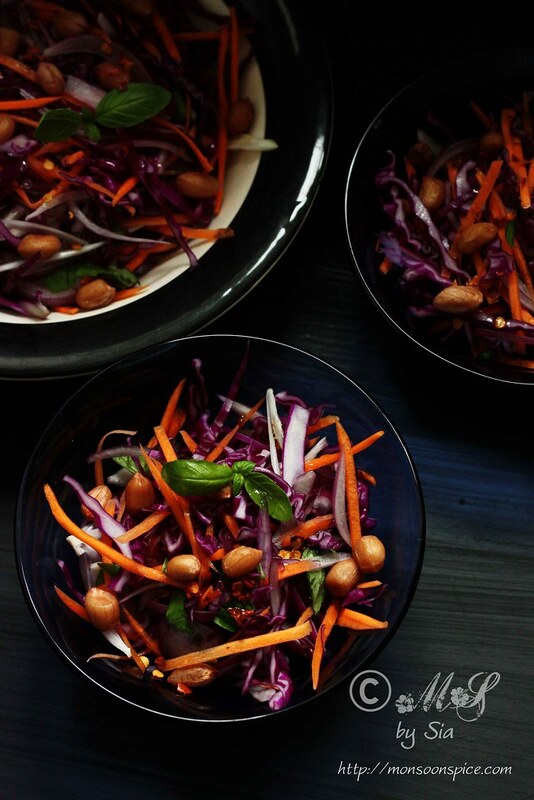 colourful, beautiful pictures taken and yummy dish you got there. beautiful site.